Nintendo released the newest refresh for its Nintendo 3DS line on February 13 worldwide; it’s called the New Nintendo 3DS (or the New Nintendo 3DS XL, assuming you go for the larger model), and it features the most dramatic overhaul of the 3DS line yet, featuring increased processing power (thanks to an extra CPU core), super stable 3D (meaning you no longer need to hold the handheld in a sweet spot to maintain the 3D effect), additional controls in the form of two more shoulder buttons, and a second analog stick, called the C stick, and some smaller improvements overall. Alongside the New 3DS models, they also released Monster Hunter 4 Ultimate, the fourth installment in Capcom’s action franchise, as well as the long requested remake for The Legend of Zelda: Majora’s Mask 3D. And now, it appears that all three of these products are officially a hit. The New Nintendo 3DS sold 175,000 units in NA, and 160,000 in Europe in the first three days of availability- for those keeping track, that is 335,000 units sold in three days, which is incredible. 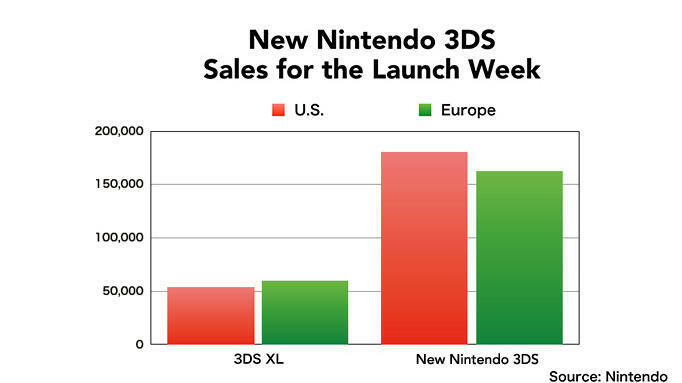 For context, the Nintendo 3DS XL sold 50,000 units in NA, and 60,000 units in EU, for a total of 110,000 units in the first three days of availability. Meanwhile, The Legend of Zelda: Majora’s Mask 3D has sold 350,000 units in the US, and 220,000 units in Europe, for 570,000 units sold in just these two territories, also in three days. For context, the excellently received A Link Between Worlds sold 190,000 in NA and 150,000 in Europe for a total of 340,000 units, in the first three days after launch. 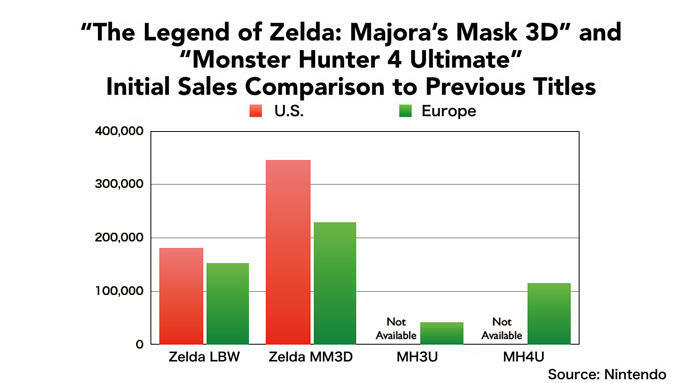 For Monster Hunter, we only have numbers for Europe, as that is the only region where Nintendo published it (Capcom handled the title’s publishing in NA and Japan), but the game has sold 110,000 units in Europe in this time period, compared to Monster Hunter 3 Ultimate’s 40,000 in the first three days of availability; that said, coupled with its recent performance in the UK charts, as well as Capcom’s confirmation of the game hitting 3 million units in sales worldwide, I think it’s safe to assume that the game is officially a hit. You can check out our review of the New Nintendo 3DS XL right here; for reviews of The Legend of Zelda: Majora’s Mask 3D and Monster Hunter 4 Ultimate, stay tuned, as we will have them for you shortly.